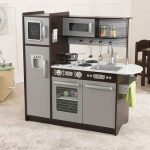 A play kitchen is possibly one of the best toys for your children if you want them to grow into responsible individuals. A child’s mind is very impressionable. What you teach them today will turn into their traits tomorrow. And cleanliness is one such habit that needs to be inculcated in children from the very beginning. So don’t just clean your child’s play kitchen, teach him or her how to do the same. Because just like charity, cleanliness begins at home too. 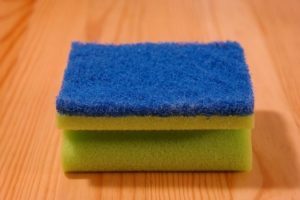 If you are cleaning the play kitchen yourself, then the best way to do that is by dipping a cloth in a mixture of water and dishwashing soap. Gently wipe the wet cloth over the kitchen items, preferably in a circular motion. When it comes to the narrow spaces or edges, make sure to wrap the cloth around your finger and reach all the spots to avoid any sort of dust or dirt build-up. Once done, rinse the cloth with clean water and wipe off the soapy residue from over the toys. After that, you can either let it air-dry or wipe it off with a clean, dry cloth. Air-drying is, however, the best option to avoid germs. If you want your child to clean it, you can teach him the above-mentioned process only. To make it safer for your tiny tot, you can replace the dishwashing soap with baby shampoo. So, even if your child touches his or her eyes, so that they don’t start burning. You can also rinse out a spray bottle and then fill it with luke warm water and a few teaspoons of vinegar. Spray the mixture directly on the counters or the utensils and wipe them with a clean piece of cloth. However, it will be wise to not let your child use this mixture. Also, a sink filled with soapy water is a good way to clean the loose items. But the ones attached to the play kitchen still need to be wiped with a mild detergent to make the entire set-up germ-free. Wood is known to have anti-bacterial properties, but even then, it is best to take the necessary steps to avoid all sorts of bacteria or viruses. Soaking a cloth in white vinegar and wiping the wooden play kitchen is a hassle free way to keep it clean. Wood does not need frequent cleansing, but doing this once in a while should be enough to maintain good hygiene. And you don’t need to worry about the smell of vinegar as it will go away in minutes. If you want your child to clean it, then just make him take a clean, dry cloth and wipe off the dust. It is usually advisable to not use water to clean wooden items. You can take care of disinfecting the play kitchen yourself by making a 1:1 mixture of rubbing alcohol and water in a clean spray bottle. Just spray moderate quantities of the solution all over the toys. Leave it on for a minute and then just gently rub a clean cloth over the play kitchen. Your play kitchen has now been completely disinfected! What should I do if I want the cleanser to be completely chemical free? You can use a steam cleaner to clean the play kitchen and all its accessories. But it will be difficult for your child to handle such a device. The chemicals that are present in mild dishwashing soaps or baby shampoo are not toxic, so using a chemical-free method is not that necessary. But yes, as a parent, you’ll be the best judge. If your kid is allergic to any chemical, it is best to not take any risk. Unlike adults, children are at a stage where their immunity system is still developing. Viruses that cause common cold, influenza and many other such infections can get transferred to the surfaces of children’s toys at any time. Unfortunately, your tiny tots are highly susceptible to these mini monsters. But with these simple procedures, you can easily keep all disease-causing germs at bay as your little ones play!